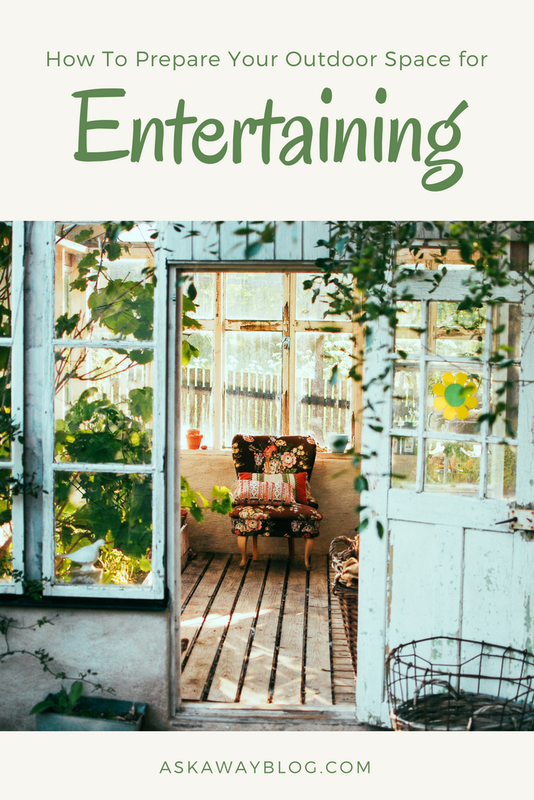 If you are a homeowner or have any kind of cozy outdoor space, chances are you entertain people at your home at least once or twice a year outdoors. That being said, there's still some things you can do to not only refresh and maintain your outdoor space but to liven it up a bit so that your guests have an even greater experience. Here are a few ways to prepare your outdoor space for entertaining this year. Now is the time to get out there and deep clean everything. If you left your patio furniture exposed to the elements over the winter you will likely have some grime built up on them. Make sure you use a cleaning solution, a scrub bush, and a high powered hose setting to spray them down. If you have siding in your outdoor area that seems pretty dirty, give it a good wash with your hose. They even have cleaning solutions for siding that you can add to your hose nozzle as an attachment. And of course if you have a patio make sure you sweep all the leaves and debris and then give a good spray with the garden hose. Any patio furniture that is delicate like a glass table top should be sprayed down with cleaning solution and paper towels. If you have furniture cushions or pillows you can also spray them with water (if they are water resistant) scrub gently with a brush and then leave them in the sun do dry. Outdoor lighting can be great but it can also attract bugs in the evening so I like to add subtle lighting that doesn't scream for the moths to come out. Patio lights can be strung around the area where friends gather. Solar power lanterns and garden stakes are a great way to light up the area and any walking paths and of course torches (with citronella to keep the bugs away), candles, and faux lanterns for the table tops also add a nice touch. You can plan a pretty picnic but you can't predict the weather (did you sing that?! ) so always have some sort of protection from the elements. We have a screened in porch which is great but sometimes the sun comes in at a nasty angle. Install blinds in your sunporch to protect against the sun, get umbrellas for your patio for shade, and if you can, a retractable awning works wonders with rain. Decorations for your outdoor space can be great but sometimes they aren't practical. Things will break and even the occasional patio chair pillow can get shredded by squirrels so make sure you choose items that are pretty but serve a purpose. Garden stools are great for extra outdoor seating but can also serve as a place to rest a drink, a phone, or a plate. Comfortable patio chairs with cushions are great and you can even get stackable chairs and just set cushions in them when in use. When choosing furniture or décor, weather proof material is best. If you go with wicker, make sure it's okay to leave it exposed to the elements! What do you do to prepare your outdoor living space for entertaining?